Me and My Neon Box, 1971. Acrylic on canvas. Collection of the artist. New Mexico Desert, 2011. Oil on wood panel. Purchased through a special gift from the Louise Ann Williams Endowment, 2013. National Museum of the American Indian. Chief Joseph series, 1974-1976. Acrylic, ink and wax on canvas. National Museum of the American Indian. Over Lolo Pass, 2003. Charcoal, gouache and encaustic on paper. Collection of the artist, courtesy of June Kelly Gallery. Night, 1991. Oil, acrylic, wax and copper on canvas. Collection of the artist, courtesy of June Kelly Gallery. 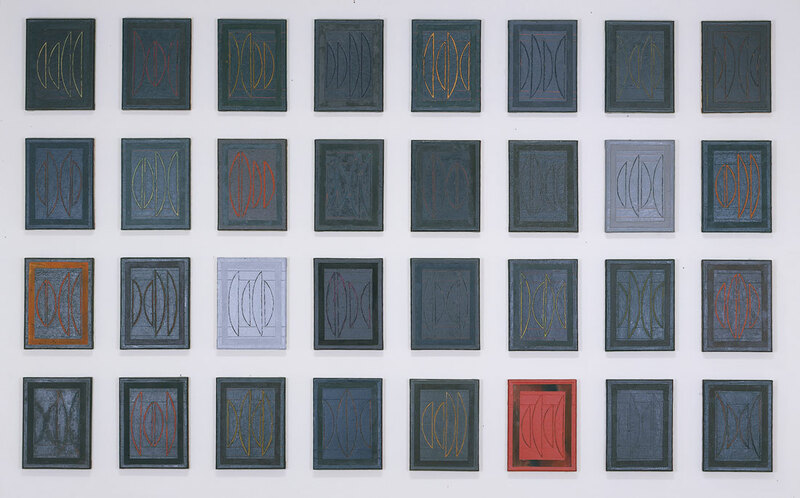 The ability to bridge various art movements in single works is a hallmark of her career. In the mid-1960s, Kay WalkingStick was a young wife and mother living in Englewood, NJ. Her husband, a journalist and magazine editor, commuted to New York City. Kay aspired to be a painter. She had shown talent from childhood and had earned a BFA degree from Beaver College in Pennsylvania. Throughout the Sixties and Seventies, she juggled the demands of her art with child­rearing and domestic life. She rented studio space in nearby Teaneck, New Jersey and got a few gigs teaching art. And then, in 1973, she enrolled in a master’s program at Pratt Institute in Brooklyn. 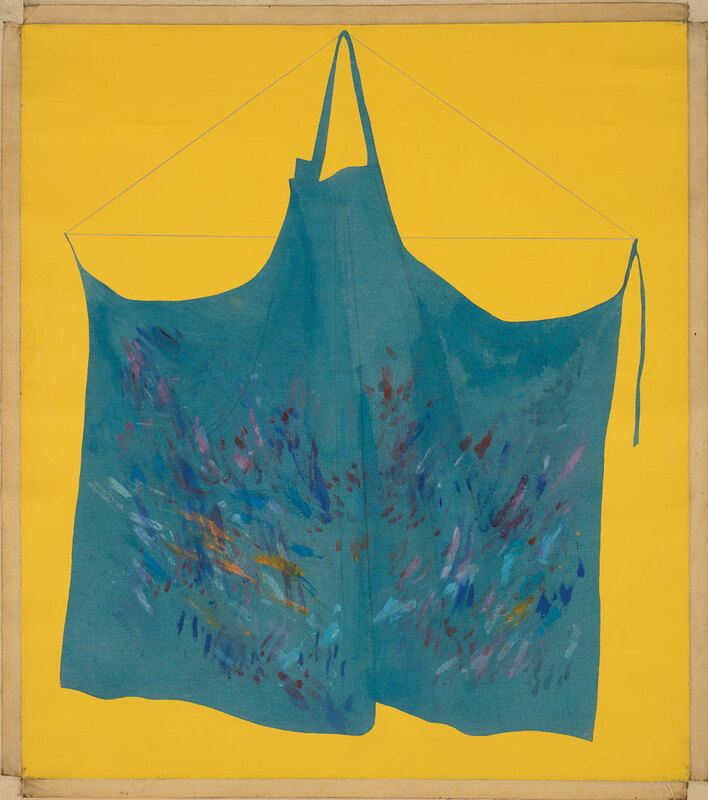 WalkingStick’s paint-smeared aprons are shown draped in an open, inviting way, as if they had personalities. They are a feminist statement, but the paint streaks on the apron allude to abstract expressionism, while the elevation of ordinary object into art is a nod to Warholian pop. This ability to bridge various art movements in single works became a hallmark of WalkingStick’s art, as did her Native American identity. Now in her early 80s, WalkingStick is being honored with her first full-scale retrospective. It opened in Washington’s Museum of the American Indian and has since traveled across the country to museums in Arizona, Ohio, Michigan and Oklahoma. Now, “Kay WalkingStick: An American Artist” is in its final venue, the Montclair Art Museum, where the artist once taught. It remains on view through June 17. WalkingStick is descended from a storied Cherokee family who trace their lineage back to the 1830s, when tribes such as the Cherokee were forced to move from the Southeast to reservations in the West, a tragic exodus known as the “Trail of Tears.” Her grandfather, Ralph Simon Walkingstick, was a tribal leader and lawyer who practiced in both tribal and non-tribal courts. He married a non-Indian, as did Kay’s father, who attended Dartmouth College, had a career with the international YMCA and did geology work for oil companies. WalkingStick’s parents separated before her birth, and she barely knew her father until she was older. The youngest of five children, she was raised back East by her siblings and her mother, Emma McKaig Walkingstick. Though only one-quarter Cherokee, young Kay took an early interest in her Native American heritage and changed the spelling of her name to match that of an Indian chief she read about. 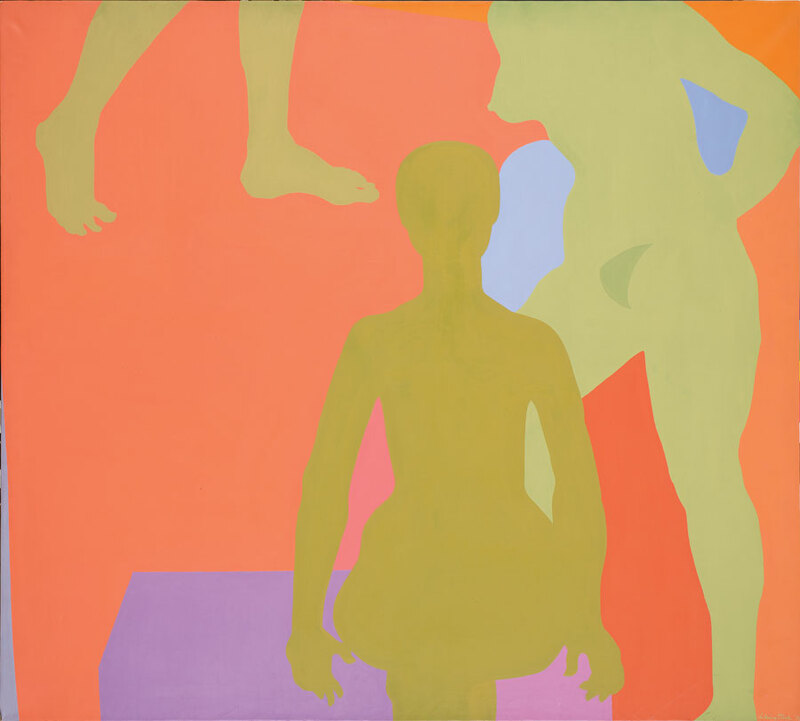 In the early Seventies, she had a go at pop art, painting in a flat cutout style with pastel colors. One of these, Me and My Neon Box, was recently bought by the Newark Museum. Indian activism in the Sixties and Seventies heightened awareness of her heritage. She followed up her apron paintings with an identity series titled Tepee Form. At the time, however, she was also tacking toward abstraction. Unlike the aprons, which looked like aprons, the tepees come off like abstract veils of color. Later, she heard the siren call—or what some might call the drone—of minimalism. For John Ridge, an elegy for a martyred Cherokee leader, is devoid of narrative content. It’s a mostly black field inscribed with faint arching lines. These stripped-down arcs became a signature motif. They’re at the heart of WalkingStick’s Chief Joseph series, a tribute to the hero of the Nez Perce War. It consists of 32 small, dark panels, each a geometric variation on the theme of four closed arcs. WalkingStick has said that numerous panels were meant to evoke the many battles Chief Joseph’s band fought with the U.S. Army. It’s natural to think, then, that the repeated closed arcs represent Indian bows. For a while, her work became completely abstract. 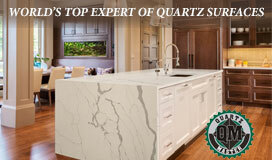 Much effort—and paint—was lavished on surfaces. She mixed wax, pebbles and other grit into her paint, yielding thick, industrial-looking textures. Into these, she made deep grooves or incisions that reveal layers of paint beneath. When the underneath color is bright red, the paintings look wounded. Wanting to be a pure, formalist painter on the one hand while hinting at Native American themes and other narratives on the other created a tension in WalkingStick’s art. The tension yielded a new format—the diptych. 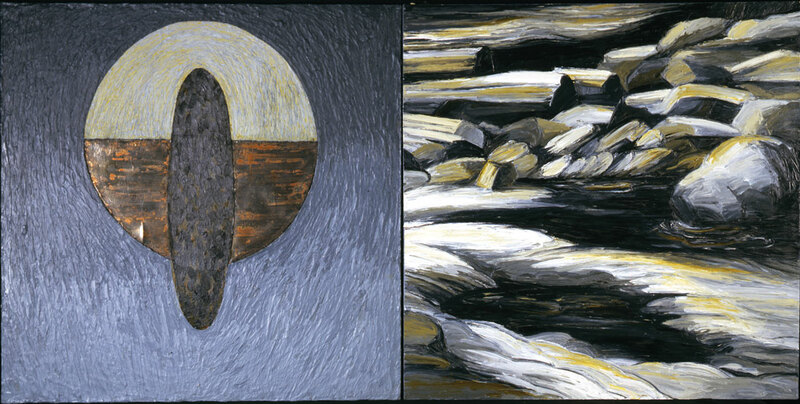 In these, she spoke in both languages, abstract on the left, representational on the right. Sometimes, it’s easy to see a relationship between the two halves. In Letting Go From Chaos to Calm, for example, the right side shows what appear to be crashing waves and swirling surf. Opposite this is the calm side of the equation, a white pie-slice beneath a gray submarine-like shadow. Such clear and satisfying dialogues between the halves are more the exception than the rule. There’s a palpable relief, then, with the paintings made after 2000, in which WalkingStick relaxes into an easier relationship with landscape. 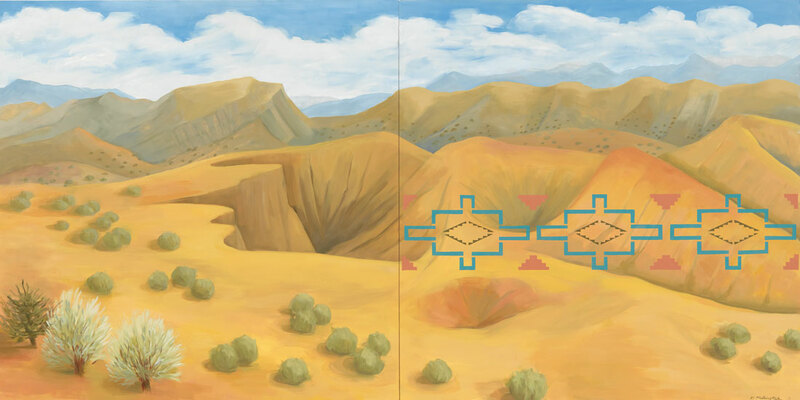 In New Mexico Desert, the yellow desert, with its canyons, mountains and scrub brush, flows across both halves of the diptych. Superimposed on the right side, however, is a Native American pattern, drawn from parfleche bags, a Native American craft. The distinctive graphic style of parfleche is itself a reference to landscape features, like an abstract map. It hovers on the surface of the painting like a stamp or a watermark. At the same time, WalkingStick acknowledges her own unusual journey. In the beginning, she engaged with all the modernist styles of her period —abstraction, pop and minimalism. There have been heartbreaks and disappointments in WalkingStick’s life. In 1989, when she was 54 and had just started teaching at Cornell, her husband, Michael Echols, died suddenly of a heart attack. She may not have reached the highest rungs of fame as an artist, though she has been called the most celebrated artist of Native American ancestry working today. She has a New York dealer, has taught at colleges all over the country and has received just about every grant, fellowship and residency available, including three sojourns in Rome. Today, she is married to artist Dirk Bach, and the two live in a Victorian townhouse in Easton, Pennsylvania. Editor’s Note: “Kay WalkingStick: An American Artist” continues through June 17 at the Montclair Art Museum, 3 South Mountain Avenue, Montclair; 973-746-5555, montclairartmuseum.org.